The old ‘phone, perched on a convenient bit of packaging, doing the timelapse work. 31st October 2018 This is my first use of my old ‘phone to get a time lapse film of the view from my window in Aime2000. I love the way the high clouds and the lower clouds are in two different wind systems almost orthogonal to one another. 1st November 2018 Another time lapse view of a day in the Alps (Aime2000). 2nd November 2018 A day of cloud and snow going to pretty total white out at times. 5th November 2018 Another day from Aime2000. 6th Novembber 2018 Another daylight day condensed into under three minutes. Great changes of wind direction. 9th November 2018 Another more sunny day up here. Moments when sunbursts in the afternoon are like weak searchlights and a brief flare of pink on Mont Blanc as the sun set. Ends with reflection of the corridor light as I came back in from shopping down in Plagne Centre! 10th November 2018 Today started with a lovely sunrise hitting Mont Blanc but as the day went on it clouded over. Still a nice enough sequence for clouds and plays of light. 11th November 2018 Flickers of glorious pink light at the beginning and end and one of the clearest sequences of cloud steaming off Mont Blanc and two relatively low cloud systems at angles to one another though generally a rather calm day by the standards of these little videos. 12th of November 2018 The sky stayed blue for most of its visible area, for most of the day so not the most exciting video for foreground action but I love the way that Mont Blanc is like some stage magic brew: seemingly brewing up its own white head of bubbling cloud all day. I thought its peak had been more visible: shows how little I looked up from the keyboard! Sad?! 13th of November 2018 Waves of cloud not that much above Aime 2000 I guess as they clearly cut well below the summit of Mont Blanc. Coverage varies as they hours pass with some sunbursts in the mid afternoon that dance over the land like followspots or searchlights (OK, they’re not that obvious, but they’re there.) If you’re wondering what the white vapour in the extreme bottom left early in the day, it was the artificial snow sprays being tried out on Golf (that slope running away down there). 14th November 2018 Almost no cloud at all, all day. In fact a little ridge of cloud is there to the west of Mont Blanc in the morning and another one to east of her in late afternoon. They’re like the shoulders of polar bears not sure whether to skyline or not! That leaves you watching the sun sweep the shadows of the mountains across and watching the activity of humans getting things ready for the ski season. I hadn’t noticed ’til I watched this but they were running the little ski lift straight down ahead, between the two apartment blocks. That’s the life up “S’s litle black” as it’s known to us, where tnp is prone to go off piste through the trees at the top or dropping over the edge on the bend. 15th November 2018 Another amazingly blue day. Sadly, the video doesn’t catch the glorious colours, particularly of the early morning and end of the. More testing of the lift on S’s little black run down there and odd early morning whisps of vapour swirling off “Les Hauts Bois” (that’s that brown slab immediately in front of me). Those swirls are completely invisible in real time. Interesting! 16th November 2018 Another day of blue skies and intense sun. Much better in the “full HD” of real life than in only middling resolution timelapse but I still like watching the shadows sweep around and the ant like scurrying of we humans and our machines in the foreground. 17th November 2018 This was a varied day with light snow brought on northerly winds in the morning through to brilliant sunshine in the afternoon with an easterly driving the clouds and ending clear and cold. You can just see the artificial snow blowers coming on at the extreme left at the end of the day. 18th November 2018 Another amazing blue sky day with bright sun but I suspect the air temperature isn’t getting much above zero as the artificial snow blowers are now on continuously and their fine spray is drifting into view on the left. 19th November 2018 Well this was a change from the blue skies of the last few days! Quite a lot of snow and some lovely bubbling clouds down in the valley below. Haut Bois puffs away like a steam engine turning its engine over from time to time and diggers scurry round between it and Club Med. Can’t work out what they’re doing. 21st November 2018 I think this was a good one to watch in timelapse, it’s got a bit of everything: a sense of the sunrise tinting things pink _above_ the thick layer of cloud just above our heads then a wonderful sliver of light cutting between the low clouds as the sun sets in the late afternoon. A hut is delivered and left on the nursery “slope” in front of Club Med. About 1’55” in a small, thin, dark slice of cloud scurries across from centre left to exit stage left (not, sadly, pursued by bear) but how could it move in completely the opposite direction to all the other clouds? Then there’s a lovely hubble and bubble of little cloud below in the late afternoon. Already watched it all twice! 22nd November 2018 Wow, a very blue and sunny, but a timelapse dull day? I like the little clouds bubbling up like smoke signals in the late afternoon on the tip of the mountain on the left, I think it’s called Roignais. They’re sometimes only visible because of the shadows they cast on the tip of the mountain. A day in two parts as my main laptop had stopped charging the ‘phone which died. Dark, louring snow cloud sweeping over through this part. Lost a bit of time recharging the old ‘phone. I like the way the valley straight ahead, beyond Bourg-Saint-Maurice, I think it goes up to La Thuile, seems have its own snow/rain/cloud system swirling in for some hours. 24th November 2018 I think this is a wonderful day to watch. I found I had to watch it through twice as the two things that struck me a hard to have in focus together. The first thing is the seething and boiling of the clouds down in the valley and the high ones scudding over. The other thing for me is the snow. A good 10cm or more of powder snow had fallen overnight and you can watch it melt off the trees straight ahead and the broad slope of the mountainside across the valley, both catching the full blast of the hot sun through the day. 25th November 2018 I think this is a really meditative one! The sun sweeps majestically around the clouds flow determinedly forward as the day goes on, ranging from thin high slices of white to lower, darker banks hinting at snow but never reaching that density. People pop in and out on the balconies of apartments in Hauts Bois. I suspect they’re from the letting agencies fettling things up for the start of the season (16.xii.18). 26th November 2018 In real time this has been a very white day. A lot of the time the snow was such light, large flakes that it was going up as much as down though there has been some net fall. Speeded up I think the clouds boiling and shifting are wonderful and the Hauts Bois boiler puffs away like Thomas the Tank Engine stuck in a snow drift! 27th November 2018 Wow, speeded up this is mostly a grim looking swirl of snow and cloud. The wind seems to be mostly westerly and the cloud swirls and boiling around below is glorious. In real time it was much less dramatic. There was snow in the morning and cycling down to Plagne Centre (1km or so below, off to the bottom right) was a bit challenging and damn cold even with ski gloves and sensible clothing but really it wasn’t tempestuous as the timelapse suggests. Clear sky now so a cold night I suspect. What will tomorrow bring?! 28th November 2018 It’s been a day of blue sky and brilliant sun here but speeded up the action is most in wonderful clouds hiding the top of Mont Blanc for most of the day and a superb show of standing wave clouds downstream of those. A couple of times during the day a more distant mountain to the North East grows a turban. I think it peaks at four layers. Glorious! 29th November 2018 Lovely pink and glowing colours at dawn and dusk and wonderful streaming clouds in between. Another beautiful day up here. 30th November 2018 Distant view rapidly disappears and the day becomes a swirling of snow and cloud with visibility rarely reaching across the little valley to the road up to Plagne Centre. Lovely swishes of cloud coming up the little valley in the late afternoon. 1st December 2018 part 1 Extraordinary cloud for the first few hours of the morning. Irritatingly, the ‘phone died around midday so the day is in two parts. 1st Decmember 2018 part 2 Less dramatic than this morning’s cloud but still lovely swirling around. 2nd December 2018 A day of swirling and eddying cloud. The timelapse makes it clear how much is formation and dissolution, not just being blown around. A fun day to watch from the warm and speeded up. Sadly for skiers, towards the end of the day the temperature rose well above zero and it’s been rain, not snow, that’s been falling. 3rd December 2018 Rainbows!! Actually, mostly this was an impressive swirling, seething cauldron of fog, cloud, snow and, sadly for the ski slopes, quite a bit of rain. But there were rainbows: fun to see them in timelapse and how they move as the sun moves. I think there are four distinct ones but one is very faint and disappears quickly. 4th December 2018. Yet another day in two parts as the ‘phone died, moaning, incorrectly, that I wasn’t feeding it. 4th December 2018 part 1The ‘phone gave up again midday. I think it may limp through to my return to the UK next week. Lots of swirling and boiling cloud and far more Alpine Choughs visible as black flashes. 4th December 2018 part 2 The day returns after the ‘phone finally rebooted. Clouds and sun and a brief pink flush as the sun set. 5th December 2018 The sun has been pretty strong all day with mostly blue sky and more contrails than true high cloud. However, to me it’s one of the better timelapse days as the horizontal bands of cloud around the 3000m+ mark are stunning as are the way “standing wave” clouds (my term, must sleuth this up) can be remarkably stable for significant periods downwind of the major peaks, partcularly Mont Blanc, and sometimes are way, way downwind of the peaks. 6th December 2018 Snowy day until mid afternoon when the sky cleared and ends with lovely pink glow on Mont Blanc. Another good timelapsed day! 7th December 2018To me, this is a great cloud day. Dark banks of cloud blow away quite fast and lovely lenticular clouds in the mid to late afternoon and clear standing clouds way downwind of Mont Blanc then. 8th December 2018 This has been a day of snow or snow cloud up here but from time to time in timelapse the veil rips open and you can see rather wonderfully down into the valley below and the snow on the slopes the other side. Down there, and once in those parting of the veil phases, up to Plagne 1800 below us, you can see what I now thing of of as the “warm humidity/condensation” clouds bubbling around below looking very different from this snow laden stuff up here. 9th December 2018 This is probably only one for those who like peering through sleet and distortion. A lot of snow had fallen in the night and the wind was howling around the building a lot of the day and hammering things into the window. Most o the day the falls, which fluctuated, were falling just above freezing I think and the ancient double glazing was clearly leaking enough heat so that the ‘phone peered out through alternating snow, ice with slush running down in the warmer moments. I leant out about every hour and tried to wipe things clear but it’s a pretty blurred and murky image a lot of the day. Still, it conveys the swirling precipitation fairly well! 10th December 2018 Another day of much cloud and some snow so visibility is generally pretty low. The window was mostly clear today, just a few scrubs. A lot of human scurrying around Club Med (the building with the strange grey, white and brown decor directly below). Clearing snow and preparing for the season. When the clouds clear what intrigues me is the sharp snow line on slopes the other side of the valley and how high that line is considering that its waist to neck deep here in the drifts and probably a metre everywhere. Is there a brief flicker of near rainbow at one point as the sun momentarily cuts through? 11th December 2018 The last of the year and a beautiful day. Much scurrying around of humans (you can see the snow clearing on the terrace of Club Med) and lovely clouds bubbling below. 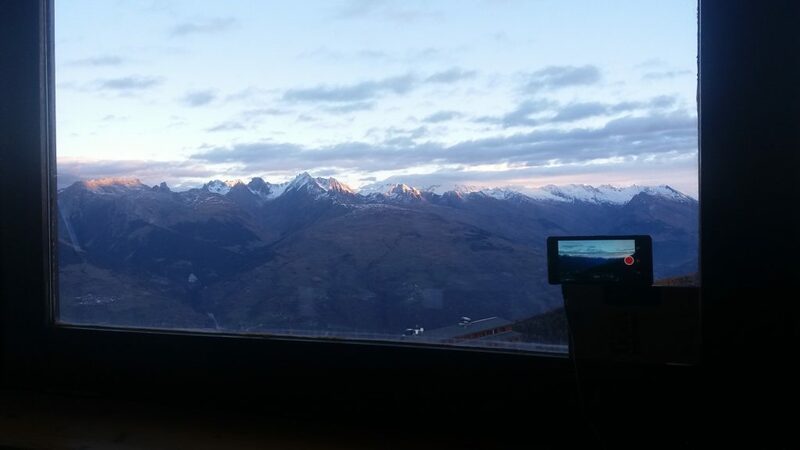 The sunset which tinged Mont Blanc salmon is oddly not really caught. I’ll miss this view!